You’ve heard cockroaches can survive a nuclear blast (not true). You may have heard they can live for decades (not true), and you may have even heard they can survive for up to a week without their head (that one is disgustingly true). Fact or fiction, we’re all pretty terrified of the longevity and strength of cockroaches and for good reason. While they can’t survive a nuclear blast, they are pretty resilient. And they’re found almost everywhere. Unfortunately, getting rid of roaches is something we all need to stay on top of. The process of getting rid of a roach infestation is difficult, but it does work. Cockroaches love food, and they’re not picky eaters to say the least. They especially love what you leave behind on the counters and floors, and they’re crazy about grease spills. If you want some company from cockroaches, just go to bed without cleaning up dinner night after night. You’ll get several new roommates in no time. But if you’d rather not be greeted by cockroaches every morning, do the dishes, wipe off your counters, cover your leftover food, sweep your floors, and vacuum your rugs. And don’t forget your yard. Cockroaches will get quite cozy in decaying branches, wood, and leaves. Clean these up, and if you do need to leave a pile for a short time, keep it far away from your house. Prevent these nasty bugs from ever coming into your home by sealing up all cracks and holes on the exterior of your home. Fix weather stripping around your doors and windows, and fix holes in baseboards, inside your pantry, and any other areas of your home. 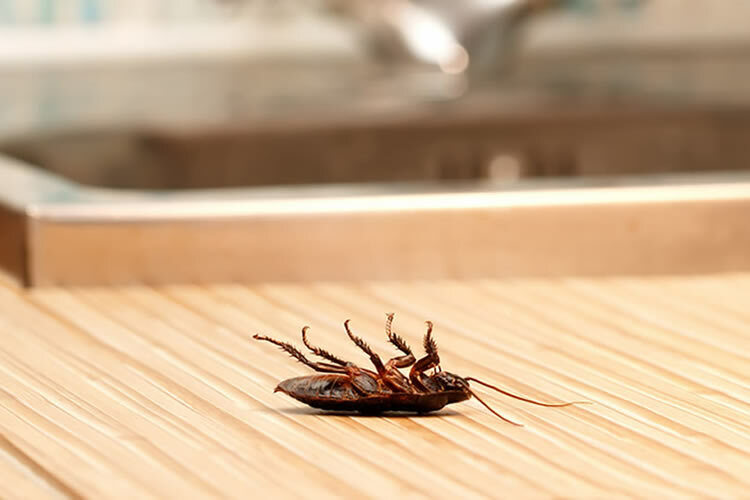 A cockroach can survive a week without its head and a full month without food, but it will dehydrate without water. Fix any leaks you have in your house, even if they’re just small. Don’t let water sit in plants or your sink. This is also good practice for minimizing mosquito infestations. If you’ve kept a clean home, sealed up all entry points, and fixed all water leaks but still have cockroaches, don’t feel bad. You’re not the only one is this situation. Here are some other helpful ways to keep cockroaches away. One way to kill cockroaches is to use a mixture of sugar and boric acid. Mix three parts boric acid with one part sugar, and sprinkle it behind your appliances, under the sink, and into cracks along the edges of counters. The sugar will lure the cockroaches and the boric acid will kill them. You can also do this with equal parts sugar and baking soda. If you see a cockroach, and can quickly get to it, you can spray it with a mixture of soap and water. The soap will suffocate the roach. Put bay leaves in the areas where you’ve seen cockroaches. They hate the smell and will steer clear. Use a brush or empty ketchup bottle to apply diatomaceous earth around your baseboards. While safe for humans, the substance is lethal to cockroaches (and ants). Use a mixture of one tablespoon cayenne pepper powder, one crushed garlic clove, and one tablespoon of onion paste. Put it all in a spray bottle filled with water, let it sit for an hour before using, and then spray wherever you’ve seen cockroaches. Put a half-full jar of water in the areas where you know you have a roach problem. They’ll climb in, but won’t be able to get out. Despite your best efforts, you may still not be able to completely get rid of cockroaches in your home. If you find yourself in this situation, hire a professional pest control company, such as Barefoot Mosquito & Pest Control, to get rid of all your cockroaches. Contact Barefoot today at or request a pest control quote online! Barefoot Mosquito & Pest Control © 2019. All Rights Reserved.